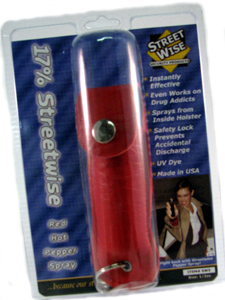 17% Pepper Spay is a powerful self- defense spray. Its active ingredient is oleoresin capsicum processed from the hottest peppers in the world. The devastating effects of this spray will stop the most pain-insensitive subject like drug addicts, psychotics, and those under the influence of alcohol. 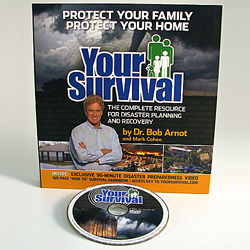 This is the best disaster preparedness book we have ever seen. This 160 page book comes with a 90 minute (very informative) DVD. It covers - Before the Disaster Strikes - During an Emergency - After the Crisis. In addition you will receive an access key to Yoursurvival.com with up to the minute crisis information. All in all this is an exceptional source of information at a very reasonable price. 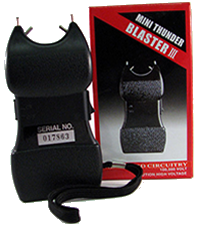 Produces 100,000 volts. Uses a 9 volt battery (not included. 1/2 Second will cause muscle spasms and dazed mental state. 3/5 seconds will cause loss of balance and muscle control, mental confusion and disorientation. One year warranty. 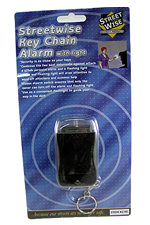 This 125db alarm blast with flashlight is a great way to draw attention to ward off attackers and call for help. All IOSAT is fully FDA approved for thyroid blocking in a radiation emergency. Please know that IOSAT is the ONLY full-strength potasium iodide tablet approved by th FDA which can be sold in the US. Each standard package of IOSAT contains a strip of 14 tablets, with each tablet containing 130 mg of potasium iodide. The tablets are double scored to split easily and cleanly into 65 and 32.5 child doses. The world's most widely used pepper spray in law enforcement and corrections, First Defense® has just gotten better. With our complete line of aerosols, we are able to offer an OC level of intensity ranging from .2% Major Capsaicinoids to 1.3% MC. The variations in the MC% means that you can now select the level of intensity of OC for the environment required. We use independent laboratory testing to ensure consistent quality of each product. Formulation Weight: 1.47 oz. Delivery System: Stream. -Uses Balloon to ensure adequate breath sample. -Accurate to +/- .02% BAC. -Percent scale on test for easy reading. -Shelf life of one year. The ABT is best described as our heavy duty industrial package. It combines the protective plastic tube found in the BAT package with the no frills approach of "just tell me how to use it" found in The Alcohol Test package. A two-color insert gives instructions for use. The ABT-4 package contains a test with two reagent bands; each band reads .04% BAC, for the maximum reading of .08% BAC. Each package contains a single test, a balloon, and a two-color insert with instructions for use. The ABT-4 is ideal for testing at the .04% and .08% limits. Each ABT-5 package contains a single test and a balloon. The ABT-5 has three reagent bands and reads to .15% BAC. Sometimes simple is best. The Alcohol Breath Tube uses basic time proven technology that was first used by law enforcement over 30 years ago. Because of the reliable results this test produces, the Alcohol Breath Tube is our most popular breath alcohol test. It is our only disposable breath alcohol test which provides a quantitative estimate of alcohol level. 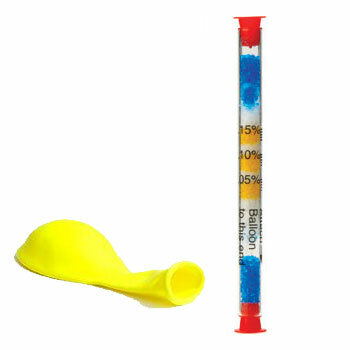 Because the test requires the user to inflate a balloon, it also gives the highest assurance of a valid breath sample. It’s hard to fake blowing up a balloon. Satisfied customers include corrections programs, halfway houses, DWI schools, work release programs, rehabilitation programs, schools, and industry. The Alcohol Breath Tube is based on a simple chemical reaction. 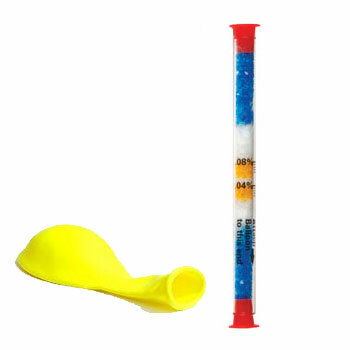 When yellow crystals in the tube are exposed to alcohol from a person’s breath, the alcohol turns the crystals green. The color change moves up the length of the tube. Readings are made at the highest level of color change using a percent scale on the test, much like reading a thermometer. Unlike any other disposable test, the color change in the Alcohol Breath Tube is semipermanent, and even intensifies with time. This allows the test itself to be saved as documentation of results. Pass/Fail at two different levels. Shelf life of up to four years. Easy to use; blow directly into the test. Lowest detection level of any disposable breath test. The CheckPoint Breath Alcohol Test is the simplest to use of our disposable breath alcohol tests. The user crushes the test between their fingers, then blows into the test for 12 seconds. Readings are made in two minutes by noting the presence of a color change from yellow to blue or green. 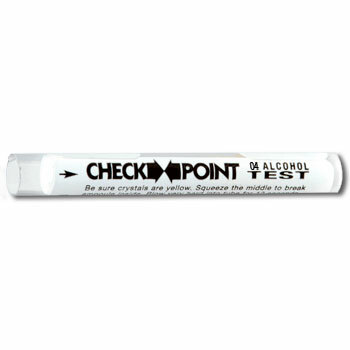 The CheckPoint Breath Alcohol Tests come in two different levels of detection, .02 and .04. We recommend the .02 level to agencies testing for zero tolerance programs. The .02 level is the lowest level of detection of any disposable breath alcohol test. The .04 level is popular for employee testing and other situations where a higher threshold level is required.